For all our warts I would not want to live anywhere other than this great country of ours, the US of America. Ray Charles singing “America” in the background, Oaks and Pines swaying to the warm gentle wind, and Baseball coming on shortly. 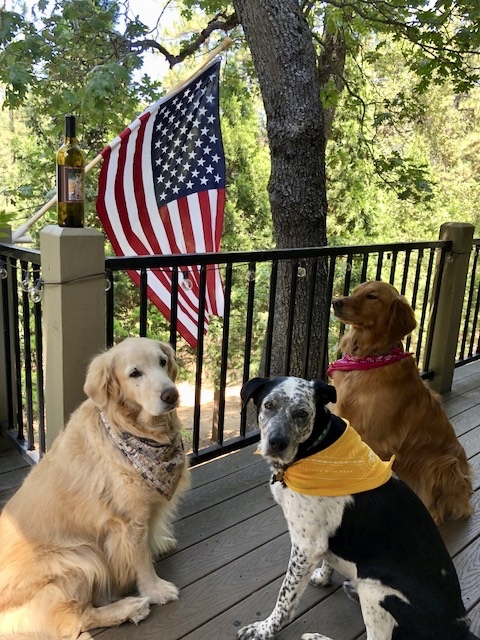 We are truly blessed at the Golden K.
Whether you stand, sit, or lie down for the flag Kloe, Kali, and cousin Ben wish you the best of bests on this Fourth Of July, Two Thousand and Eighteen. 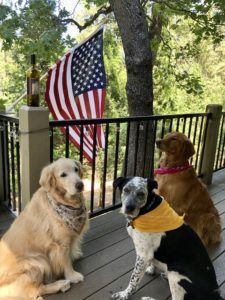 The patriotic crew seem to have the good life down pat. 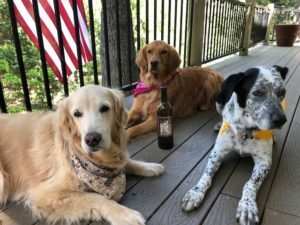 Dogs, wine, and family visits. A great combo to any howliday. Hope you enjoyed the day and the visit.